Last weekend I had an illuminating conversation with Stephen about many facets of his work: from the perspectives he has gained through his adventures in wild places, to the techniques he uses to capture and transform these wilderness experiences into music. Stephen spoke with me over Skype from Nacogdoches, Texas, where he is Professor of Composition at Stephen F. Austin State University. Stephen Lias: That’s a term that I evolved into. I was not particularly interested in outdoor adventure activities until my mid-30s, and I’d at that point been a composer for some time. Even after I started doing outdoorsy sorts of things, it wasn’t until a number of years later that I started really drawing on my outdoor activities to provide inspiration to my musical compositions. And that really began to focus on the National Parks about six years ago. The term “adventurer-composer” I think is a reflection of what my typical method is when I write a National Park piece, which is that I don’t want to see a National Park from the car: I want to go to these places and to have a really immersive experience, and to challenge my own boundaries and my own comfort zone. And so, I like to go on a multi-day backpack, or a kayaking trip—something that is very adventuresome. As I was trying to describe this to other people, the term “adventurer-composer” sort of evolved and seemed apropos to the situation. It’s not something I’ve ever heard used before, and so in addition to being, I think, a pretty good summary description of what I do, it’s also given me a sort of a niche as a composer, since there aren’t a lot of us out there doing that sort of thing. I realized that I didn’t really need a Guggenheim Foundation fellowship in order to do this. I just needed to do it on my own timeline and on my own terms. I was applying for a Guggenheim Foundation fellowship. As it turned out, I did not receive that fellowship, but in order to apply for it I had to assemble a sort of proposal. My proposal was to be a sort of Composer-in-Residence for the National Parks. That was the very first time I thought up the idea. When I didn’t get the grant, I was initially fairly discouraged, and then I realized that I didn’t really need a Guggenheim Foundation fellowship in order to do this. I just needed to do it on my own timeline and on my own terms. Very soon after that, the first request came in for a new piece from a trombonist and so I used that as my first opportunity to say, can I write about a national park? That first piece, it’s called River Runner—and it’s one of the pieces that’s going to be on this upcoming CD—that was really the piece that proved to me both that I could write good music about a national park, but also that a national park could provide me with a whole new array of inspirational resources. Composers always need some sort of inspirational resource on which to build a piece of music and, for me, that was the piece that showed me that this could be a really great direction. There is no standard formula for a National Park Artist-in-Residence program. The National Park Service does not provide any sort of structure to all the parks about how to do that. The result of that is that every single parks residency is completely unlike every other one, and that makes it very exciting. Some of them, like Rocky Mountain and Glacier, provide you with a very nice, comfortable cabin to live in. Others, I would say Gates of the Arctic is the best example of this—I mean, there are no buildings, or trails, or roads in Gates of the Arctic National Park and so, as an Artist-in-Residence, you are going to have a wilderness experience. There’s no other way around it. So, when I go to places like Glacier, I tend to set aside four or five days to do a more extreme backpacking experience, just to put myself out of my comfort zone and stretch my boundaries. When I was at Rocky Mountain, I set aside a few days to hike to the summit of Long’s Peak, which I’d always wanted to do, and that was one of the more strenuous things I’d done at that time. Then, when I was at Gates of the Arctic, I had to submit to them information about my level of fitness, and my backcountry training. They ended up sending me on a 10-day backcountry patrol with a ranger, which was the most exhausting and challenging backpack I have ever done in my life, without question. So, when you compare that with the residency at Rocky Mountain, where I was staying right on a park road in a very comfortable cabin, they’re extremely different from one another. And yet they’re all very inspiring in their own way. 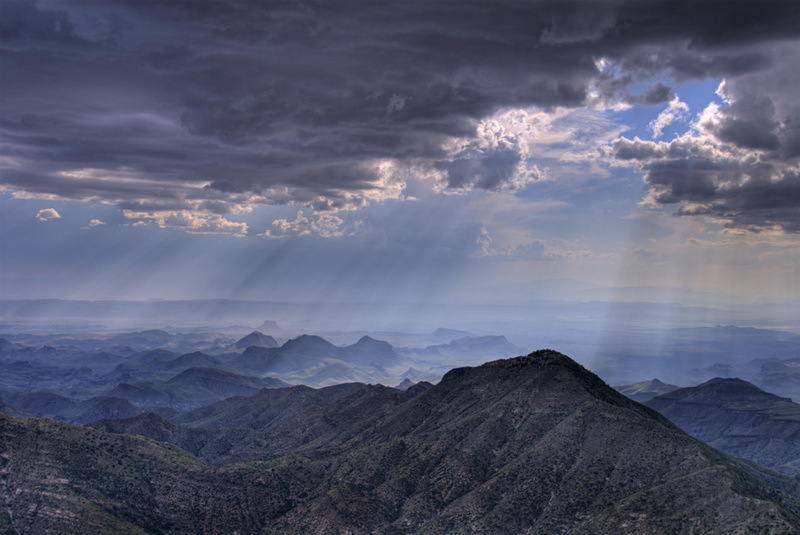 South rim of the Chisos Mountains, Big Bend National Park, Texas. Photograph by Louis Vest. When I serve as Artist-in-Residence at various National Parks, they ask me to do public presentations in their visitor centers. This question…is the main topic of a presentation that’s about 40 minutes long [watch online]. My music is very much trying to capture my own emotional and physical experience in those places. I can say that each piece is somewhat different in how I make the transition from the inspiration and the experience to the actual piece. But by and large, my approach to it—and this is not by any means universal with all composers, it’s just mine—my approach tends to be focused on the experience that I’m having. In other words, it’s a self-awareness approach. So, as I am standing on a precipice at the south rim of the Chisos Mountains in Big Bend National Park, for example, there’s also this other consciousness floating in space beside me, watching me, and saying: “Oh, isn’t that interesting, how it makes you nervous to get that close to the edge? I wonder what that fear of heights nervousness would sound like in music.” Like, there’s part of my brain that’s evaluating my mental and emotional state and then thinking about what those mental and emotional states would be like in music. So, my music is very much trying to capture my own emotional and physical experience in those places. The result of this is that I write music that moves relatively rapidly through emotional states, and contains frequent surprises and changes in direction. This is certainly only one of many possible approaches. For example, John Luther Adams just won the Pulitzer Prize in composition this year, and he’s a composer who writes about Alaskan landscapes. His music unfolds at this glacially slow, incredibly mesmerizing pace, and it feels to me like it is more omniscient in its point of view—reflecting the reality of how slowly glaciers move, or how slowly mountains rise. When I hear his music, it’s as if there are no people present, as opposed to my own pieces where personal reactions and experiences are so near to the surface. Other composers look at a bear, or a bird, or a caribou, and they write music that tries to get inside the consciousness of the animal. What is like to be a bird in a rainforest, or a caribou on the tundra?…One other technique is a more literal capture of sounds: composers who utilize bird songs or wolf calls in their music, that’s also a very common way that’s easily understood by a general audience. Maybe I’ll capture a little bit of that spirit of adventure in my music and…the audience in a concert hall may feel a little vicarious call of the wild in themselves. So, each different composer approaches it from a different sort of compositional point of view, and then that point of view provides them with some sort of drama that they can capture and translate in their music. My music uses elements of all of these approaches, but mostly focuses on my own emotional experience. And I think that’s because I like the idea that maybe I’ll capture a little bit of that spirit of adventure in my music and that the audience in a concert hall may feel a little vicarious call of the wild in themselves when they hear my music. I surround myself with hundreds and sometimes thousands of pictures of the place so that I can recreate that experience for myself and put my brain right back where it was in those moments. You could probably tell from my website, I’m an avid photographer. So, even when I’m using a text I surround myself with hundreds and sometimes thousands of pictures of the place so that I can recreate that experience for myself and put my brain right back where it was in those moments. So, Range of Light was similar in that I’m accustomed to using photographs inspirationally. But normally, the photograph puts me back into that mental experience that I had. Now, I have been to Yosemite National Park. But Nathan Nabb, the saxophonist that I was working with on this project, suggested that, instead of using my own experience, we use the Ansel Adams photographs. And so, Nathan and I sat down with many dozens of Ansel Adams photographs and together we selected the four that ended up being the movement titles of the piece. I think a couple of them were pictures that he definitely wanted to use, a couple of them were pictures I definitely wanted to use, and we negotiated about it for a while. Then, because I wanted a greater backstory, I went and did a lot of reading, both on those specific photographs but also very generally on Ansel Adams’ writings about the Sierra Nevada mountains there in California. 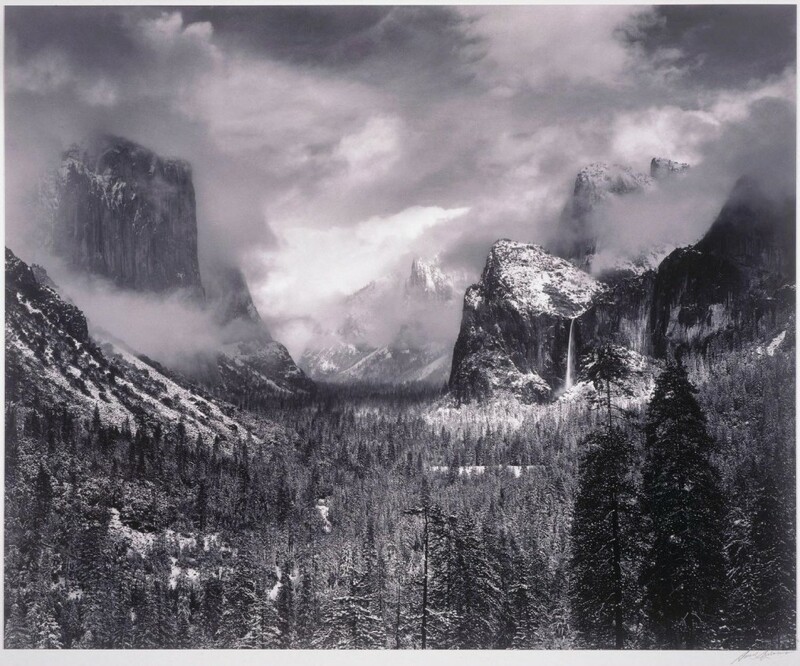 For example, Clearing Winter Storm, the last movement [see audio excerpt and photo above], is one of his most famous photographs of Yosemite and it appears on the cover of his volume of photographs, which is called Range of Light. He has written accounts of what he remembers on the day that he took that photograph. And likewise, with Vernal Falls, he had written his sort of personal impression of the movement of water through the high alpine tundra toward a waterfall. I tried as much as I could to see that place through [Ansel Adams’] eyes and his memory and to try and capture that in the music that I wrote. So, as often as I could, I used the writings of Ansel Adams remembering his experiences in Yosemite to inform and inspire the musical choices I made in each of those four movements. Clearly my own experience with Yosemite also informed what I wrote, but I tried as much as I could to see that place through his eyes and his memory and to try and capture that in the music that I wrote. Range of Light was a great challenge to me on many, many levels. Nathan Nabb is one of the finest performers that I’ll ever in my life have the opportunity to work with, and he’s a dear friend, and so in addition to having the pressure of, “Can I write a piece of music that is worthy of Yosemite National Park?” and “Can I write a piece of music that is worthy of Ansel Adams?”, I also had this burden of, “Can I write a piece of music that effectively showcases the amazing talent of this friend of mine?” So, there was a lot of pressure on me going into the project. I can say I’m very pleased with the product. I think it’s one of my most substantial pieces. Altogether, it’s 25 minutes long and it takes both the player and the listener through quite a range of very profound emotions. This is a very weird, quirky thing that I’m doing. And I don’t do it on every piece, by any means. I’ve done it now and then, and when I do it, it solves either a logistical or an inspirational problem for me. And I can tell you how it arose. The very first time I did it was on River Runner, that piece I wrote about kayaking in Big Bend National Park, and I was stumped about how to begin the piece. I knew that I wanted to try to capture the nervous energy of setting out on a trip and being excited to put your kayak in the water but being frustrated that it’s taking too long to pack the boat. It was going to be a trombone and piano piece, and I thought, I’ll have the piano go: “yacka dacka dacka” [sings], kind of a nervous energy figure, but I couldn’t figure out what to do with the trombone. So one day, as I was driving home after being very frustrated at not coming up with good ideas, I started sort of talking to myself in the car. And I said, “Well, what actually was happening that I’m trying to capture in the music?” Well, we were getting all the gear out of the car, we were throwing it on the ground, trying to figure out how to get it onto the boats. Getting all the gear out of the car, throwing it on the ground. [Sings rhythmic phrase] That moment when I realized, “Oh! That phrase of text that I just said, that has a rhythm and a shape to it!” You know? And it was like a discovery for me. Of course, we all do that when we write music for singer with text. But it had never occurred to me to write instrumental music that was essentially setting a text to music as if it were for singer. I thought it was the stupidest, funniest, weirdest, most embarrassing thing I’d ever done as a composer. I got home that night and I wrote three pages of lyrics for that piece and then I set them to music, as if it were a Broadway show! I thought it was the stupidest, funniest, weirdest, most embarrassing thing I’d ever done as a composer. So, I wrote that whole movement and gave it to the trombonist and I asked her if she liked the movement. And she did. And then I said, “Well, let me tell ya, there are words to it.” I wanted to make sure she thought it was a good piece of music by itself, and then I revealed the words to her. She loved it then, and subsequently sometimes when we perform the piece we let the audience see the words and sometimes we don’t. It seems to be just as successful either way. But that was the first time I tried it. Text leads you on to different ideas…and makes the music more asymmetrical and more unpredictable and, I think, a little more engaging dramatically. Initially it got me past a creative block, but subsequently I’ve discovered that using the text also sends me down a different creative direction than I would go if I were not using the text. If I just think in abstract music, I might be tempted to write balanced phrases that, you know, are four measures long and are very classical, whereas text leads you on to different ideas and has little extra phrases at the beginnings and ends and makes the music more asymmetrical and more unpredictable and, I think, a little more engaging dramatically. I’ve found it very useful in the few pieces that I’ve done. 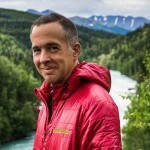 I find that each time I go deeply into nature, and particularly wild places—and many of my experiences in that way have been in the far north and Alaska, especially—I find that there is an ongoing contrast of perceptions. One of which is, how utterly fragile and insignificant I am in the grand scheme of things. And there are a whole lot of corollary thoughts that arise from that, I think, in anyone, when they are out in a situation where they realize that an avalanche, or a boulder, or a thunderstorm, or a flash flood can snuff them out of existence and there’s nothing they can do about it. I think that’s a very scary and healthy thing to face. But on the other side of that same coin is the opposite feeling of one’s own abilities, personally—so, for example, you try hiking further than you’ve hiked, or climbing steeper than you’ve hiked, or facing a wild animal you haven’t faced before—and you come away from it with a very real belief in your own ability to handle things. So, your self-esteem is stronger by putting yourself out of your comfort zone and learning that you can handle these things. So, that’s one facet of empowering yourself. I think that putting yourself on the edge of your comfort zone and seeing how wild wildness truly is, that is gives you a very intimate connection, and awareness, and humility, about both the power and fragility of the natural world. And then the other facet is that even ‘little old you’ traveling through this vast wildness have a very distinct effect on things. When you’re practicing leave-no-trace principles, when you’re putting out a fire, when you’re thinking about your potential to damage or protect this environment, you’re aware of those things in a way that you can’t be aware of them as your separating the recycling in your garage, you know? I think that putting yourself on the edge of your comfort zone and seeing how wild wildness truly is, that is gives you a very intimate connection, and awareness, and humility, about both the power and fragility of the natural world. I know that’s very broadly stated, but I every time I go out into the wild I’m aware both of those sides of this coin. 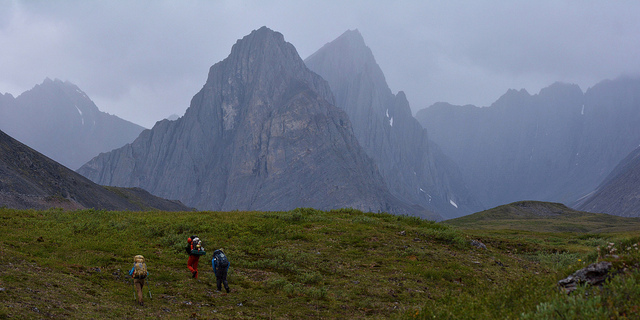 Thunder Valley, Gates of the Arctic National Park, Brooks Range Mountains. Photo by Paxson Woelber. Over the last four years, I’ve had the amazing privilege of leading the field seminar called Composing in the Wilderness, where we take nine composers each year into Alaska. We go first to Denali National Park, and then up to Yukon–Charley Rivers National Preserve, and allow them to have this experience. And almost without exception, this is many of these composers’ first time truly in the wild, for many it’s their first time in Alaska. And so I get to stand back and watch this natural location have its effect on these people. In those cases, when I get to be the observer, I’ve learned that one thing is true: and that is, that wilderness changes people. It’s equally true that I can’t ever predict in what direction that change will take them. There are people that go into wilderness and the way it changes them is that they decide they never want to be in wilderness again! 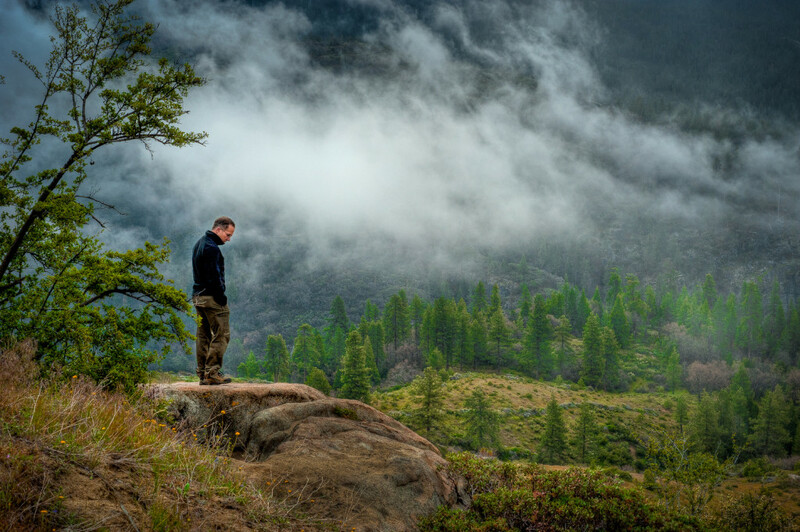 There are people who go into wilderness and come out of it extremely motivated for conservation causes, that’s the direction that the change wilderness has on them takes them. My motivation to go to wilderness and my activity in response to wilderness has always been to make art about it, to make music about it. There are other artists, and I think I fall into this last category, who create art from whatever inspires them the most. And so, my motivation to go to wilderness and my activity in response to wilderness has always been to make art about it, to make music about it. I know other people who use their compositional language in an effort to bring about societal change, or to lend their weight as an artist to an environmental cause. And while I deeply respect and support those people for doing that that has not been the direction that my interaction with nature has taken me. It’s simply that nature, wilderness, adventure—those are the things that provide me with the most stunning inspiration. To learn more about Stephen’s work and to hear his music, visit his website and watch this video presentation he created exploring the compositional process for his National Parks-inspired works. You can also check out Stephen’s Alaska Geographic field seminar, Composing in the Wilderness.